Police say they seized a number of items following raids carried out in Derry following incidents at the wake and funeral of the mother of INLA Hunger Striker, Patsy O’Hara. Peggy O’Hara was the last of the Hunger Strikers’ mothers to die, and was laid to rest yesterday in one of the largest paramilitary style funerals seen in the city for many years. The PSNI confirmed that they carried out searches in Derry this morning in connection with a number of recent events in the city. 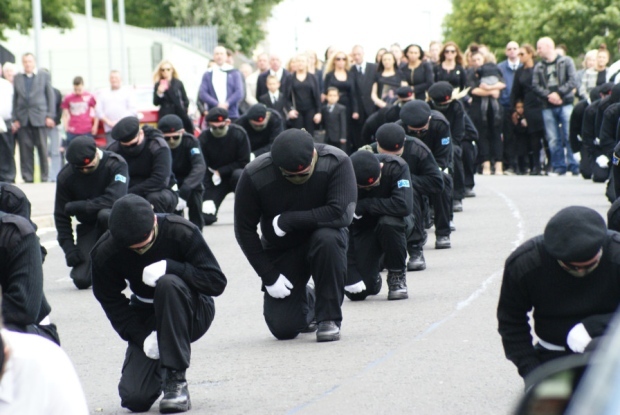 Members of terror group the INLA stood guard at the funeral of a hunger striker’s mother in Derry on Saturday. The DUP have questioned the policing of the funeral, which they say “seemed to take place without a police officer in sight”. However, one photo of the event shows a PSNI vehicle with a CCTV camera observing ranks of masked men as they parade past. The funeral cortege of Peggy O’Hara, mother of the hunger striker Patsy O’Hara, who died in the Maze Prison in 1981, was accompanied to the graveside by a ‘colour parade’ of 50 men and women in paramilitary dress. DUP MP Gregory Campbell said that prior to Saturday’s funeral, his party colleagues had alerted the PSNI to the potential for paramilitary displays at the funeral after members of the illegal republican group fired shots over the coffin of Mrs O’Hara outside her home in the Templegrove area of the city on Wednesday. “Despite our efforts with the police, it would seem that there were no visible signs of police in close proximity to the funeral cortège on Saturday,” he said. Mr Campbell said that, in contrast with recent convictions for loyalist bandsmen breaching Parades Commission determinations, it seemed INLA members could discharge guns “without fear of prosecution”. The East Londonderry MP called on the PSNI to explain the extent of the policing operation and what action will be taken against the illegal parade. Assistant Chief Constable Will Kerr said there is no “one size fits all” approach to policing but strongly denied allegations the PSNI are biased. “We absolutely reject any suggestion of bias in policing. “Such remarks are inaccurate, unhelpful and ill informed,” he said. The PSNI said that items were seized during searches as part of its investigation into the wake and funeral. A republican speaker at the funeral said that the O’Hara family supported the INLA show of strength. 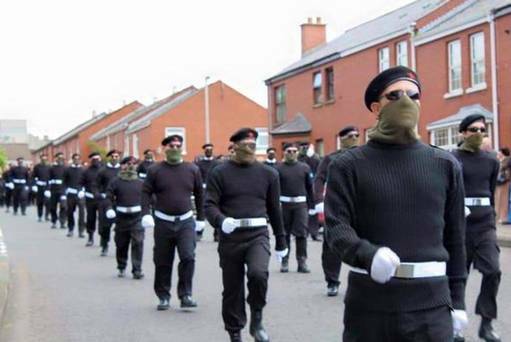 In comments reported online by the Derry Now website, Martin McMonagle of the Irish Republican Socialist Party told mourners that the O’Hara family had asked him to “thank the INLA for the magnificent show today in bringing Peggy to her resting place”. However, UUP MLA Ross Hussey said people would expect to see convictions after “this brazen display of paramilitary thuggery”. “People will feel intimidated and shocked that this is allowed to happen in 2015,” he said. The West Tyrone MLA added that the presence of paramilitaries on the streets “tarnishes the name of the city of Londonderry”. PSNI Chief Constable George Hamilton responded sarcastically to a Twitter user who questioned the policing of the funeral. The PSNI were unable to provide details of how many convictions have resulted from intelligence gathering operations at funerals. There was a large turnout for the funeral of the late Peggy O’Hara in Derry as people from across the country gathered at the Long Tower chapel to say farewell to the much loved mother of INLA hunger striker Patsy who died in Long Kesh in May 1981, 61 days into his protest. The remains of Mrs O’Hara, 86, were brought to the funeral mass in a horse drawn carriage; a tricolour flower arrangement on top said simply “friend”. In his eulogy the Reverend Brendan Collins said that he had learned much about Peggy as he sat with he family during the wake and added that he had been particularly struck by the “high esteem” in which she was held by all who had known her. “She was well known in the community and beyond, with people coming to today’s funeral from far and wide and was a huge source of comfort and support for so many,” he said. “When we reflect on Peggy’s life we think of the question ‘how did she do it’? Mrs O’Hara’s remains were flanked by a 50 man colour party who escorted her to her final resting place in the city cemetery via Bishop Street and the Brandywell.